April 15, 1999 had many meanings for each of us. Normally April 15th signals the necessity to complete and file income taxes. This year my cousin, Dave Turner of the San Jose Flycasters, and I made the journey to Sugar Creek Ranch. The ranch is just a little ways outside of Yreka. Where you may ask? Well nearly into Oregon. After driving most of the evening we arrived at approximately midnight and settled into our motel. The next morning we completed the journey and found Sugar Creek Ranch, and checked in with Mike Kalpin, the owner. We made arrangements to stay at one of the trailers on the property and started fishing. It was now approximately 9:30 and we had just started wetting line in the South lake. It wasn't very long before I had a tug on one of Ken Eugene's Woolly Worms, a black one. On the other end was this twisting, turning, jumping trout of approximately 19 inches. My first Sugar Creek Trout was about to give me the distance release. I hooked a few others that morning and proceeded to have lunch. After lunch Dave and I had a conversation with Mike. Mike gave us a tour around the property and dicussed each of the lakes. There were four active ponds in operation, with plans to add approximately five more in the future. The South pond, where we were fishing, two middle ponds and the North pond. The North pond is where the big boys hang out. The middle ponds had a tremendous population of trout and we watched a couple of anglers catch and released several fish. The fish at the middle pond are not the typical size, but the numbers are high and catching is fruitful. The North pond has some of the largest fish, reportedly to approximately 18 lb..
We elected to return to the South pond and fish another area that afternoon. When Terry Edlemann arrived he gave us the general rule and we attached a scud which started catching fish on a regular basis. The takes were not subtle, there was mistaking the take. Once on, you could expect runs, jumps and even dives. But most of all they would thrash their heads and try to shake the hook out. These fish were big and broad. 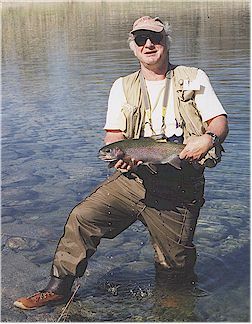 One of the 21 1/2 inch trout that I caught was just about 13 inched in girth. Good fish. That afternoon I had approximately 6 more fish before we left for the North pond at approximately 4:00. The tactics on the North pond were quite different. Large, black, bunny leaches were the fly of the day. Dave hooked into one of the 15 LB class fish that ran him across the lake and was gone. We fished for several hours without much success. Then the sun began to fall and the shadows on the lake signaled a midge hatch. Switching tactics, but not our luck we found the North pond to be difficult that evening. That evening we stayed at the trailer at the South pond. The calming sound of the river running down the bouldered stream bed put us to sleep and awakened us in the morning. After breakfast we headed to the shore of the South pond. Upon arriving we found two other fishermen in the area we had planned to fish. We watched them for a while and moved on around to another spot. The two had skill, their casts were long and presented well. Their retrieve was rapid, too rapid for the fish. All that morning no one caught fish. At 10:30 we changed tactics and position on the lake. By approximately 11:00 we started catching fish while the other two fishermen moved on to the middle ponds. I started to feel that nothing in the lake was under 20 inches. Mike had informed us earlier that the fish were breeding in the ponds but there were no signs of small fish. At approximately 2:00 it happened. I caught a 12 inch trout. I wanted to hide it. How did it get there? Why was it on my line? 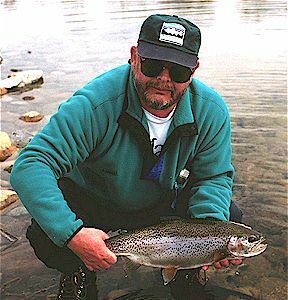 At almost any other water I would have been glad to have the fish take my fly and would taken pride at fooling another fish with my presentation, float and strike. But here, among these trophy fish I was in such a hurry to remove it and get back to what I perceived as trophies that I could not wait to release it. We fished this lake most of the day. That evening we again moved off to the North pond in search of the submarines that cruised by. Rising out of the dark depths as to say here I am, we would see these large, very large fish, cruise by and then disappear back into the merky waters of the lake. Suddenly it happened, one these monsters took Dave's rabbit leach and started stripping line from his reel. Across the lake it raced. Dave could do little to stop it. We had heard that there were a few snags. The fish have maps of the area imbedded into their circuits. That was all it needed. Dave could do nothing to stop this fish. Back and forth it went, then he wrapped around and was gone. We continued to hook other fish. Dave landed a few others, but nothing like the monsters that couldn't be stopped that day. All in all, it was a successful two days at Sugar Creek Ranch.